Dubai, UAE: InnJoo, the fastest growing smartphone brand in Middle East today announced its entry into the highly competitive TV market, which will be exclusively available at Souq.com in Saudi Arabia. “The feedback from our customers encouraged us to offer them more innovative, world class, and value for money products. With considering its strategic role in InnJoo’s smart eco-system, we took a conscious decision to expand our product portfolio with TVs and firstly release to Saudi Arabia market.” Chen added. InnJoo has launched three High Definition TVs with sizes 32 inch, 55 inch and 65 inch. The new generation InnJoo TV offers a splendid quality of liquid crystal panel, LED backlight module and the InnJoo build-in image enhancement technology co-determined a real life picture quality, brilliant colours, stunning brightness and exceptional contrast. The InnJoo T321 is a 32 inch HD LED TV has 1366×768 pixels resolution with an aspect ratio of 16:9 and 16.7 display colours offers a wide range of connectivity ports such as HDMI, AV in, VGA in, Earphone out Jack, PC Audio in and USB for video and audio playback. This energy efficient TV is available at Souq.com in Saudi Arabia for a special price at 399 SAR against the regular price of 699 SAR. The 55 inch Full HD InnJoo Smart TV, T551 delivers crystal-clear images through the remarkable liquid crystal panel as well as low power consumption. The slim design TV is equipped with Build in Wifi and powered by Quad Core processor and 512 RAM that allows humanized interfaces, and constantly renewed video materials, can easily get access to favorite shows, movies, apps and games. 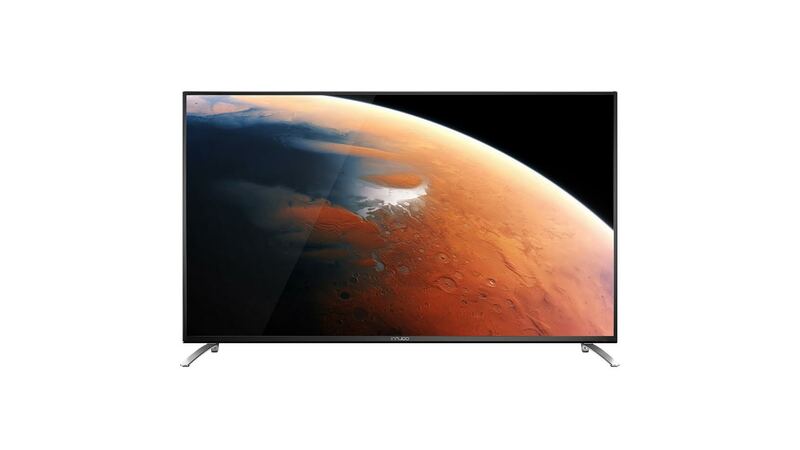 And, consumer can save 400 SAR as this 55 inch InnJoo TV is available at Souq.com for only 1499 SAR instead of regular price of 1899 SAR. The InnJoo T651 is a 65 inch Full HD Smart TV, is big screen TV that supports 2.4GHz 802.11b/g/n (2.4GHz) wireless Internet to speed up to a higher operation enabling Live videos, games, news, easy as pie. Elaborate beveling frame design for the T651, creates a strong sense of depth, with the screen embedded, it looks as natural as they are one. Smooth borders brim with fashionable sense and the two stereophony lie in the bottom part of the delicate body once again realized the perfect exterior design. Carrying a Quad-core CPU and 512MB random access memory, T651 could upload and process HD videos or images quickly. Strong process ability promises every operation responded fleetly. Basing on the mart Android 4.4 OS, T651 is a new benchmark for home entertainment that is exclusively available at Souq.com in KSA for a discounted price of 2666 SAR. “The number of consumers adopting smarter, wireless technology in the kingdom is on the upward swing. We are confident with our high quality and affordability, InnJoo Smart TVs will be a big hit in the Saudi Arabia,” concluded Chen. InnJoo is a technical startup born with Internet DNA. Its Internet journey was started by joining hands with the largest e-commerce sites in the region. Based in Dubai, InnJoo became the fastest-growing company by providing smart devices as well as software services in the MEA region.